PERKASIE, Pa. (WPVI) -- More than 200 Pennridge High School students were given detention for taking part in National Walkout Day last week and that has caught the attention of a number of famous names. Forty-six of the 225 students served their detention on Saturday at the Bucks County high school. On Twitter, the group posted video of their detention where they wore the names of the victims of the Parkland school shooting. According to the students, they sat on the floor with their arms linked throughout the entire detention, held from 8 a.m. to 10 a.m. The video was shared by some celebrities on social media. Actor Michael Kelly from 'House of Cards' tweeted, "Love our #Youth." Brian Dietzen of 'NCIS' wrote, "So proud of what you guys are doing. Keep at it. Peaceful activism is a beautiful thing to see in action." So proud of what you guys are doing. Keep at it. Peaceful activism is a beautiful thing to see in action. Alyssa Milano responded with, "These kids were given detention for participating in the walk out. This is what they did with their time in detention. Change is coming. I can feel it. And as a mom...I appreciate it so very much." In a reference to a famous 1980s movie concerning students in Saturday detention, Patton Oswalt tweeted, "Holy s---. A Breakfast Club made up of only bad----. #Pennridge 225"
The school announced the students who walked out instead of attending an in-house assembly remembering the 17 killed at Marjory Stoneman Douglas High School in Florida would be given detention. Prior to the March 14th National Walkout Day, Pennridge officials warned students who left the school without their parents would face discipline. School officials said about 800 students attended the assembly, which included a slideshow in honor of the victims. 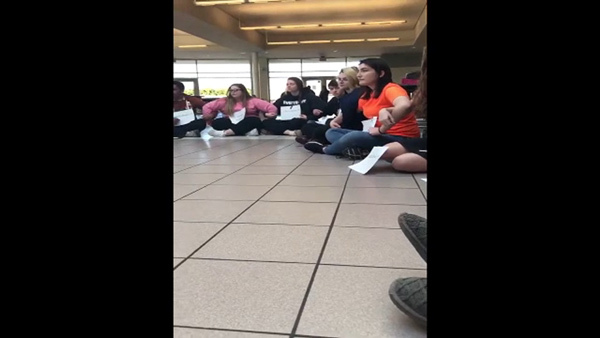 The 'Pennridge 225' group posted a video explaining why they walked out. "We call for mental health evaluations, we call for background checks, and we call for gun control reform," a student says in the video. Sean Jenkins, one of the students serving detention, posted a photo of the group being met by community members and parents on their way into the school. A GoFundMe page and social media campaign #Pizza4Protesters were created to help bring pizza to the Pennridge students and others who were disciplined for walking out.